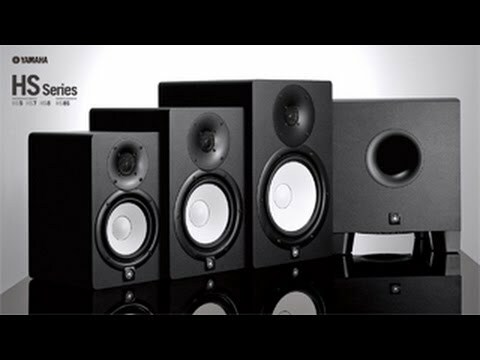 Accuracy is key to professional studio monitoring and to so this effectively, you need monitors that don't deliberately 'colour' or deceptively enhance the sound otherwise this may result a false mix which can seriously harm production. This is where the Yamaha HS8 monitor comes in. Created by Yamaha's studio monitor engineering team to deliver an exceptionally flat and accurate response that you can trust. No exaggerated bass or treble, you can be sure that if you get your mix to shine on the HS8, it will translate on any other speaker system. The elegant white cone of the HS8 is enhanced by the carefully engineered mounting system which virtually eliminates all spurious vibration and resonance that may cloud your mix. The tweeter frames utilise an advanced smooth contour design to minimise any loss of detail and produce a detailed top end that's full of clarity. Overall, you will get a smooth and accurate representation throughout the audio spectrum. The HS8 is equally powerful in a 5.1 mix situation as well as stereo and thanks to its compact size, you can position the HS8 anywhere it's required in your studio to ensure you're in the sweet spot. To further enhance this, the HS8 comes with room control and high trim response controls to help compensate if the monitors are placed near walls or if a lift or cut of a certain range is needed to compensate for room acoustics. The HS8 is the perfect, compact studio monitor speaker that will give you an honest representation of your mix so you can be sure that what you hear is completely accurate. Posted on 19/05/2016 by Ralph Love these speakers. I upgraded from a pair of Rokits and my mixes just sound better ... quicker. The bass is not as impressive in my room, but the overall mix now translates so well onto PA systems and in the car so I'm very happy. If you need a pair of speakers for mixing, and don't have 1000's to spend then these are definitely a good option and you should check them out.